Traditional markets in Korea typically offer dishes such as savory jeon, hearty gukbap, rice cakes and such but when it comes to yukhoe, or beef tartar, the thought of consuming rare meat in such a rustic setting will probably raise a few eyebrows. But Seoul's Gwangjang Market, one of the oldest markets in Korea, is known for its yukhoe alley which is teeming with people year round. Among these handful of stores the first of its kind is Jamae Jib, or "Sisters' House", which is not only the best known among the restaurants in this alley, it just may be the entire city's most famous yukhoe restaurant. Jamae Jib started out in 1974 in the same location its first branch is found today within Gwanjang Market. Back then the Kim sisters, in the small 5 square meter store, ran the place as a regular "bapjib" or simple home meal restaurant which included yukhoe (pronounced "yook + hweh" among the many items on the menu. Over the next decade, their yukhoe began to spread in popularity not only for their taste and freshness but their affordable prices which particularly appealed to the many blue collar workers of the mills and mini factories in the nearby Euljiro and Cheonggyecheon area who would come together for drinks over dishes like yukhoe. Their success inspired other stores in the same alley, and even around the market, to open up their own yukhoe restaurants but none has come close to matching the fame of Jamae Jib empire which is now run by one of the Kim sister and her immediate family. The original store and the second branch are still found in what's considered the yukhoe alley whose entrance is most easily found from the main Jongno street by finding the Woojeong Pharmacy (우정약국). Entering the dim and narrow alley with mini shops all along its sides, this is where you can find the most traditional atmosphere, still favored by the ajoshis looking to get in some yukhoe with their drinks. But most likely, because of their smaller sizes, the first two branches will likely have no seats during peak hours- particularly on weekends. But luckily there is a third, more modern and spacious branch just on the main Jongno street that's favored by the younger crowd and visitors. Facing the yukhoe alley from the main Jongno street, walk left towards Jongno 5-ga Station for about 30-40 meters and you should see the third branch on your right just after the station's exit 9 and before exit 8. Even this third branch though, will almost always be crowded so keep that in mind! The menu is quite simple with six offerings. The platter of yukhoe (beef tartar) and the yukhoe bibimbap are the two most popular options running 12K a plate for yukhoe and 6K or 10K for the bibimbap depending on the regular or larger size. The yukhoe itself is about a 1-3 person (if you stretch it) serving so for a group of four, for example, they would probably opt for a platter as well as a bibimbap (maybe the larger size for the mixed rice if you have a larger appetite). The more "premium" options include the yooktangee, which is the yukhoe plus sannakji atop it (yes, as in, the infamous live cut up, squirming webfoot octopus) and the yook sashimi which are both 25K a platter. Lastly the two "adventurous" options is the sannakji by itself at 15K (no beef here) or the raw liver and "cheonyeop" which I'm told is a part of the stomach and goes by names like the omasum, manyplies, fardel, and even bible and is 12K for a platter. Presently the younger of the founding Kim sisters, her husband and their two sons runs and manages the stores and you're likely to see them still today, running about the restaurant floor and in the kitchen. Every morning they receive their slabs of beef, which is always butchered fresh on that day, and prepare everything by hand. The yukhoe is a chuck flap cut from the cow's front which are removed of any sinews and fat and then cut against the grain for a smoother textures. The prepared beef is then refrigerated but never frozen and never reused the next day. Considering all of the preparation that goes into the dishes here and that they use fresh, never frozen, Korean beef, the prices are extremely reasonable which is one of their high selling points. Pictured below is the regular yukhoe bibimbap and a platter of the yuk sashimi. Sides are extremely simple with only a sesame oil and salt mixture for dipping, sliced garlic and chili peppers, soybean paste, and a chogochujang dip. The yukhoe bibimbap is definitely a best-seller and particularly for lunchtime crowds during the week as it's not easy to find fresh yukhoe bibimbap at only 6K a bowl. Even a bowl of regular bibimbap at most restaurants go for 7 or 8K a bowl so you can imagine why yukhoe bibimbap, at 6K, is a steal. The bibimbap's makeup is rice, topped with chopped cucumbers, perilla leaves, seasoned yukhoe, Asian pear matchsticks, and a drizzle of sesame oil and sesame seeds atop. For those that are unfamiliar to yukhoe one might wonder what the appeal of raw beef is but it's not only the thin yet soft and chewy texture but the seasoning. In southwestern Korea's Jeollado region, where yukhoe is also famous, it usually undergoes a heavier seasoning that's more gochujang or red pepper paste based. In Seoul, the seasoning is lighter, perhaps a mixture of soy sauce and sugar that gives it a sweet and slightly savory taste. Really, the seasoning's taste is akin to that of bulgogi which is probably one of the most beloved Korean dishes worldwide. I much prefer the Seoul-style seasoning which doesn't mask the fresh beef while the other ingredients adds a broader range of tasting notes and textures. For those with a bigger appetite, I definitely recommend the larger 10K size as I'm usually hungry 3-4 hours later if I go with the smaller bowl. The platter of yukhoe is the same seasoned beef as the ones that go into the bibimbap except without the vegetables and pear and instead a fresh raw egg yolk carefully placed atop it. Depending on one's style, one will either directly mix the yolk into the yukhoe or for others, they like to take out the yolk and mix it on the side as a dip. What the creamy egg yolk provides is an almost milky "base" that nets the sweet and salty beef and brings it together. It also makes the already smooth texture of the beef seem even smoother. Tough, chewy beef this most certainly is not. Of course for added texture, you can always opt for the yook tangee where the squirming, cut-up pieces of octopus will be dancing upon its bed of beef tartar. Taste-wise I don't think the sannakji adds much to the yukhoe but in terms of texture, sannakji's chewier consistencies will provide a more intriguing contrast against the softer beef. The yook sashimi is a bit different as here the beef comes in very thin little strips and is unseasoned. Because of its non-seasoning, this is probably a step up for yukhoe novices and more appealing to those who really know and admire the delicate flavors of extremely fresh beef. I'm talking the ones who order their steaks rare and don't count it as eating a proper cut of beef if there isn't some scarlet on the plate. Not that there is any blood dripping from the yook sashimi and it isn't so bad for even newbies as a range of dips are provided. The easier option is the chogochujang dip which has strong sweet, savory, tart, and spicy notes to it (mix in or remove the wasabi on the sauce bowl's side depending if you want even more or less of a kick). This dip will bring about a more comfortable seasoning similar to the yukhoe here but definitely masks the raw beef flavors more. The dwenjang dip will give you a more savory and earthy flavor that's still formidable to the natural raw beef's taste and complements the raw garlic and chili pepper slices if you want a more "organic" spicy dimension. The real beef lovers will opt for the sesame oil and salt dip which essentially acts as the salt and butter seasoning for a simple steak by minimally seasoning the beef. From left to right, mixed up yukhoe bibimbap, yukhoe, and yuk sashimi (with one slice already consumed :P). Here's a video clip of the yukhoe being mixed with the egg yolk. I should mention that they also provide on the side a simple radish and beef soup for free. This is a popular beef soup that employs on the radish to provide a deeper and cleaner soup taste with the heartier beef flavors. The ones here has a bit of spice to it, though it will register as a blip to most Koreans. They aren't huge bowls but for soup-loving Koreans, these small individual bowls provides a welcome change to the meal, particularly since it's the only actually "cooked" dish on the table. At the time of my last visit, they were doing some promotion offering this (relatively) newly launched R4 beer, made by one of the local major Korean beer companies, for a cheaper price (the beer only). I was particularly intrigued as they said they used rice in the beer. Not quite a traditional beer and yet not unlike any alcoholic beverage I tasted. Sorry R4 beer, but I'm going to have to recommend that visitors to here stick with the traditional Korean alcohols (as well as regular beer) and far, far away from you. Though I enjoy beef tartar I understand why, for someone completely new to the dish, the thought can be off-putting. But if you have an open mind to try, I can't recommend this place enough as its premium quality, reasonable prices, and taste (the yukhoe's seasoning tastes similar to bulgogi) makes it the place to try. Yukhoe lovers too, will find this quality of raw beef hard to top within Seoul (perhaps next only to the Majangdong Meat Market but certainly pricier) while adventurous eaters can try dishes like sannakji and yukhoe (hey, two birds with one stone) at the same place in a fun and Korean setting. And though the crowds and lines can sometimes be off-putting, the popularity definitely ensures that the beef is as fresh as can be. I pulled this little direction guide from the restaurant's homepage. For the first and second branches of the restaurant, come out of Jongno 5-ga Station's exit 10 and turn left into the alley and walk just about 10 meters or so before seeing the restaurants on your right. 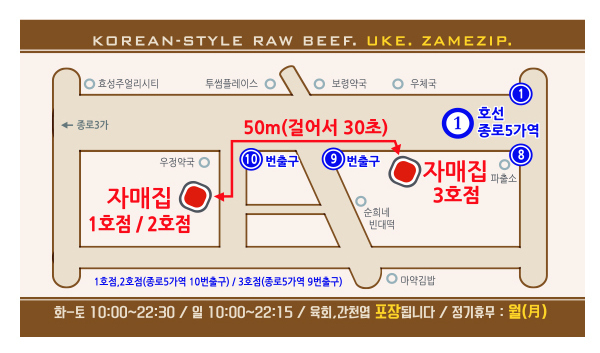 For the third store, come out of exit 9, turn right walking along the main Jongno street and you'll see the third branch on your right after 10 meters or so. The restaurant itself recommends diners come to the third store (which is the now-de facto main store) for faster seating. If you're planning to eat it within an hour or two, you can call ahead and pick up the yukhoe and yuk sashimi orders for take out. For obvious reasons, this option is discouraged in Korea's hot and humid summer seasons. As the restaurants are located in Gwangjang Market, try and leave room for the many other food offerings the Market has to offer. Famous dishes in this market include bindaetteok, ggoma "mini" kimbaps served with a tangy, mustardy soy sauce dip, dumplings, ddeokbokki, and more.